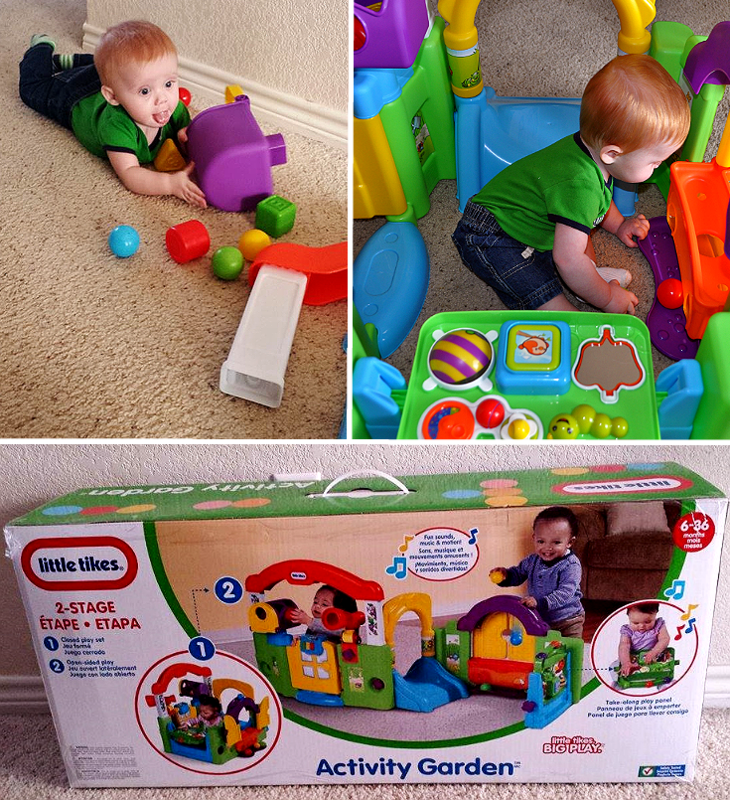 ***Thanks to Little Tikes for providing the Activity Garden for feature here on Momma Told Me. 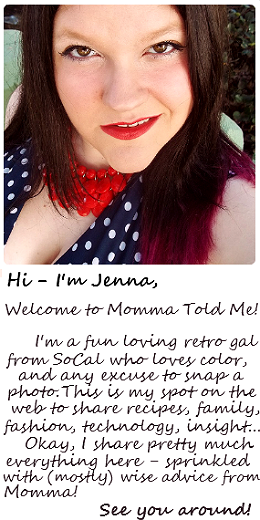 All photos are copyright Momma Told Me Blog 2015. Momma Told Me: You have to learn to walk before you run. It's hard to believe Nathan is already 8 months old- during my visit over the holidays the most trouble he could manage to get himself into was rolling himself up in his blanket- now he's just about mastered the art of crawling. It's adorable to watch him scoot along with mini hops, yet hard to watch the frustration as he works out the finer mechanics of the task on his own. He knows what he wants, but he hasn't quite figured out how to instruct his body to get him there fastest. For a toddler every experience is a chance to learn and grow; and stimulating fine motor skills through solo play and cooperative interaction help build valuable pathways for cognitive functions from those first words to those first steps. While every child moves at their own path, speeding through some skills, while taking time to work on developing others, the Little Tikes Activity Garden offers a plethora of skill building opportunities for toddlers as young as 6 months, through 3 years. This 2-Stage play set offers interactive play from every angle and converts from a confined play station (great for kids just learning to crawl and sit on their own) to a stretched out interactive play-scape that encourages climbing, standing, and elementary role-playing. While Nathan is just learning to use many of the elements of the Activity Garden we especially love that there are several new things for him to discover as he continues to build those motor skills, and many of them can be removed and taken on the go! Your child's first activity center should foster a sense of security and confidence while engaging the senses with bright colors, new shapes and sights, and interactive sound makers. The Activity Garden first converts to an enclosed play structure toddlers 6-18 months will enjoy sitting in and playing with. The colorful walls of varying heights help provide stability and security young toddlers need to establish comfort in solo play. This is especially great for dependent toddlers who have anxiety about separating their toys from the people behind them, and also particularly useful when your baby is still mastering the finer skills of balance and self support. Toddlers are very sensual, as they learn through exploration of their senses- touching, poking, pinching, and smacking are the first skills your baby will master before moving on to stacking and shape recognition. The Activity Garden's dual sided toy tray is perfect for transitioning to basic motor skill development (textures, mirrors, spinners, and buttons) to more complex language development and sound recognition. The flip side of the tray above has a 3 language interactive phone to help build preschool skills as your baby moves from age 2 to 3. We especially love how this play tray is entirely removable from the play center, itself, for road trips and travel play. Remember how we said Nathan was beginning to crawl? He is equally excited to stand on his own, and the many heights of the Activity Garden's walls allow for him to practice pulling himself up and supporting his own weight. 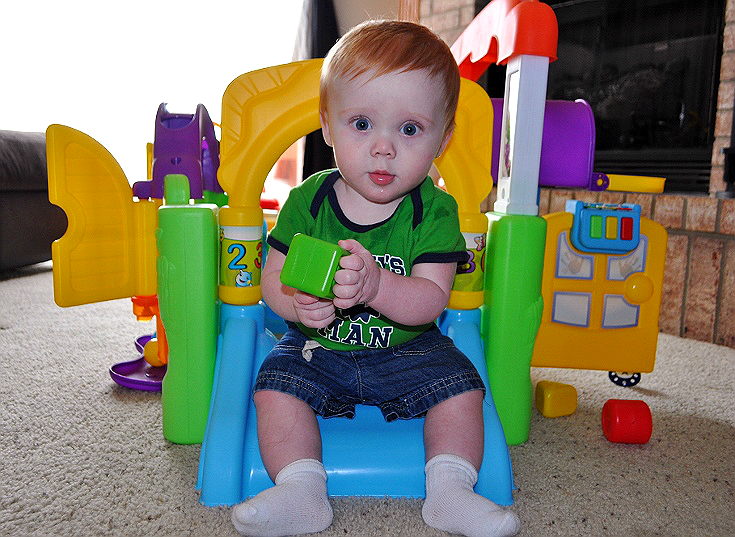 From this vantage point he can discover the shape sorter mailbox, moving telescope, and mini slide. There's even a working door with a Tap-A-Tune piano his mother's relieved he hasn't quite discovered on his own yet. 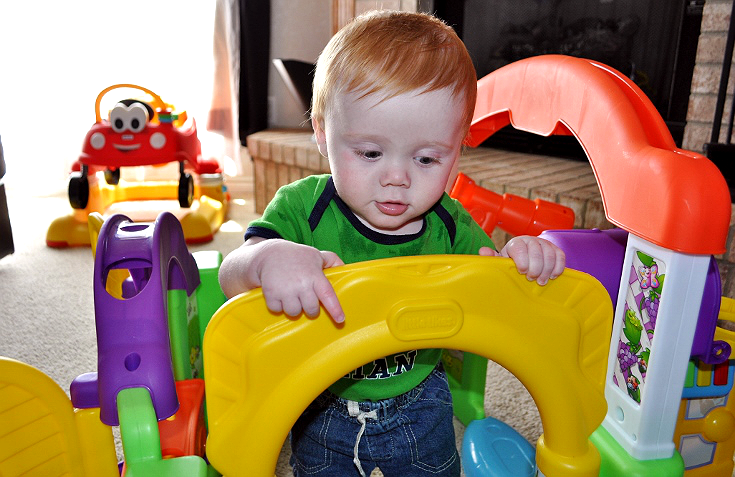 While you may not realize it, moving, or placing, objects at a point of desire, no matter how unintentional it may seem to you, is a big milestone on the road to building important motor skills. 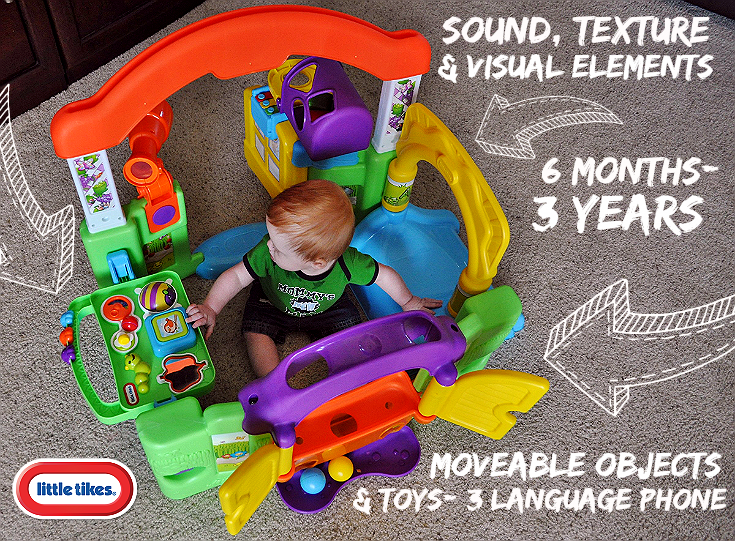 Your baby will love the many shape blocks and colorful balls that come with the Little Tikes Activity Center. Picking these up and placing these somewhere else is the first step to the intentional habit of stacking and sorting. It also helps build pathways to recollection and memory, as your infant grows and learns to retrieve the discarded object later. Expect these skills to develop somewhere between 9-12 months, with the skill culminating in shape stacking. 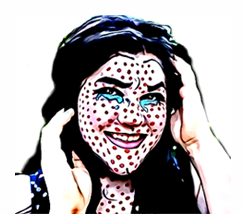 At this point you'll start to see your baby enjoy the art of scribbling- so keep those crayons up and away from the walls, Mom! While every day is a new milestone in your toddler's growth, having an all-in-one play station like the Little Tikes Activity Garden will help expand the importance of small tasks and basic learning to bigger triumphs and achievements. You'd be surprised what you baby can teach themselves with a little time given to discover on their own. Of course, you're certainly allowed to play and discover with them, just be sure to ring the doorbell first! What Daughter Says: Celebrate small milestone on the road to great developments. This is adorable and so is Nathan! So colorful and looks like a ton of fun! Wish that they had stuff like this when my kids where little. May I tell you how much I adore his red hair? What a little cutie-pie! I love Little Tikes toys - they are always so wonderful for whatever age group they are targeted. And they last forever. Look at those big blue eyes! What an adorable little man Nathan is :D While this toy doesn't look so complicated on the outside it's AMAZING just how much it can help shape such a tiny little human being such as Nathan so early on in their lives. He's too cute! This looks fantastic, defo look into this with my second child on the way when he's about the same age. That's adorable! I have something like this for my daughter and she loves it. 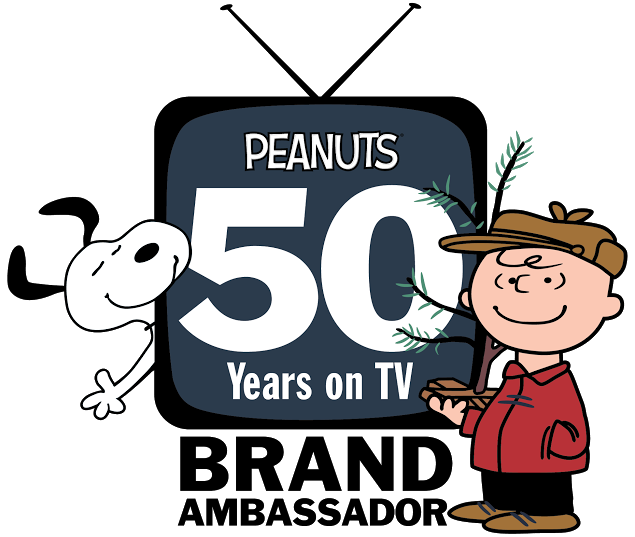 They're a great way to keep the kids occupied and having a blast. What a great activity center. I wish I had something like this when my kids were younger. Nathan looks like he's having a blast! I hate to say this but this looks like an exciting babysitter! I can see how money could get a lot done while baby Nathan was having a riot. Heck if I could get in there I think I would play. Awww! Nathan is simply adorable! This is one heck of a toy! What an awesome idea for my niece! It's actually her birthday this week! Perfect, thank you! Awe, what a cutie! This looks like it would provide hours and hours of fun. I'd love to get this for my nephew. First of all your little guy is super photogenic and very cute. I had something similar when my kids were very small. Loved it very much! Little Tykes make some great products! We loved Little Tykes toys when my kids were little. 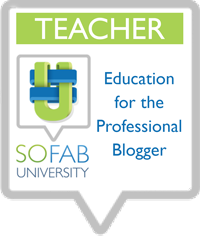 They are so great for so many different developmental stages! Oh my goodness he is precious! This looks like a great toy and a perfect way for a baby to learn about the world around them. What a cutie! 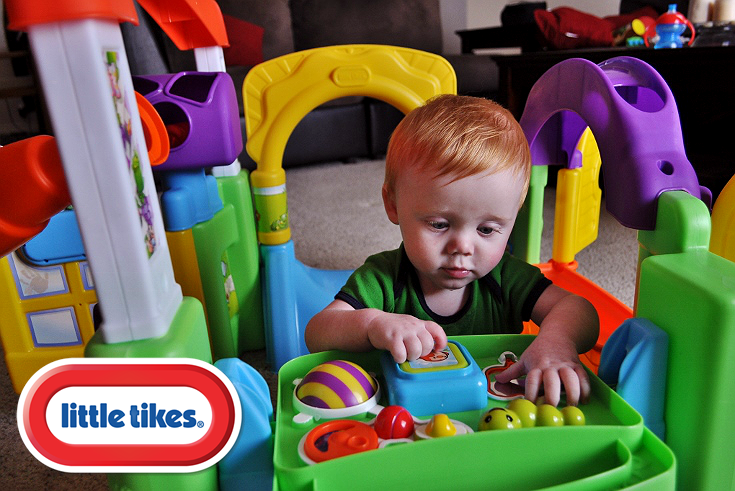 Yes, we love Little Tikes and have gone through a lot of their toys over the years. I love how the molded plastic is durable yet easy on little hands and bodies. 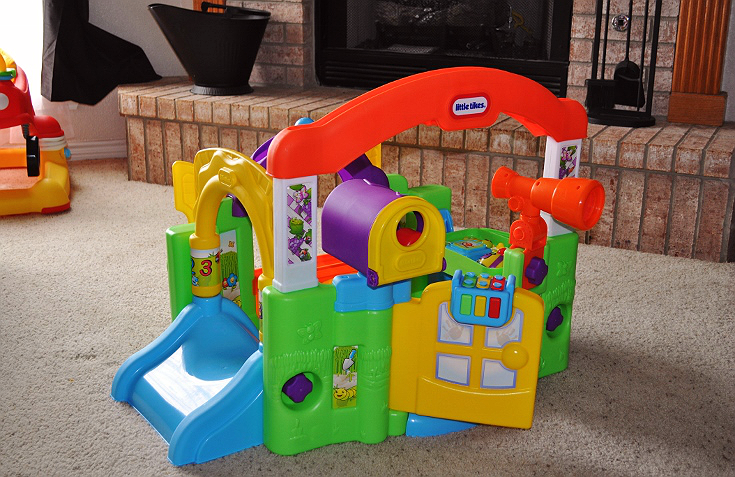 My kids love climbing and exploring on their Little Tikes toys and structures. This looks great! So many fun ways to play with it and I love that it grows with them. This is a great activity center. I will have to show this to my friend that has a little one that would love it.